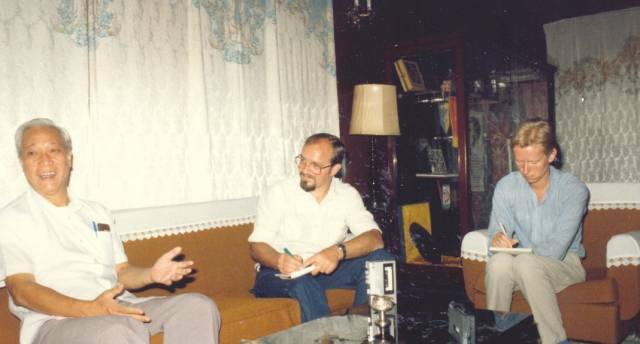 The first meeting with Foreign Minister Nguyen Co Thach, 2nd June 1984. Even though Agent Orange has such a strong impact on the memories of my first visit to Vietnam, there are other more pleasant things to recall. One of the highlights was meeting with a living legend – foreign minister Nguyen Co Thach, nick named the ‘Silver Fox’ by Western journalists for his swift and elegant rebuffs of any critical questions that a reporter could think of. My first encounter with the Silver Fox took off with a roaring laughter – his. Thach had seen an article in Nhan Dan (People’s Daily) describing our meeting with the not so friendly Chinese artillery at the border. 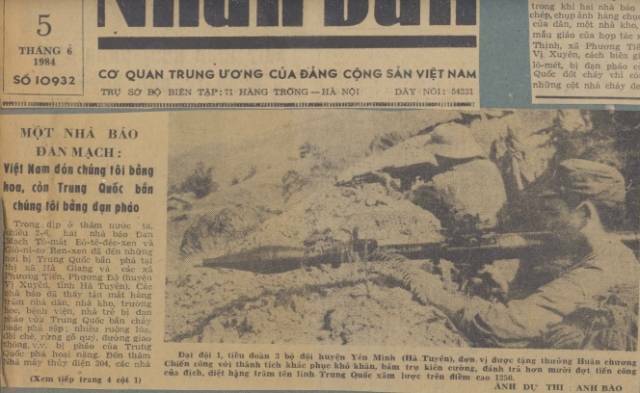 The situation was tense, after the Chinese had shelled the small border town Ha Giang the week before. We had been on patrol with a Vietnamese recon team, when the Chinese suddenly opened up with artillery at us. We had run for our lives, and it had all been rather scary. Thach gave us a wink and another friendly grin. 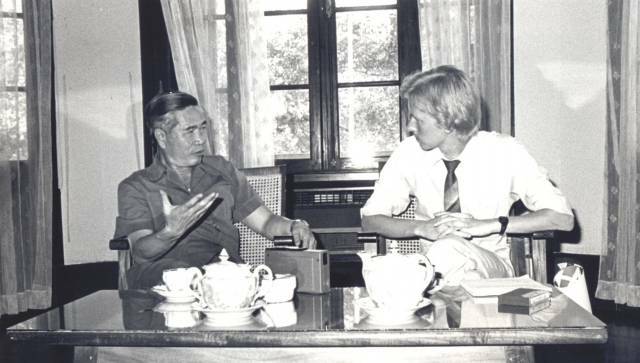 At the time Minister Thach was one of the very few Vietnamese senior politicians who spoke excellent English – wrapping his hard line policies in the charm of great intelligence. In a manner so typical for young Western reporters, I charged into minister Thach’s office with a barrage of critical questions, firing away on subjects like Vietnam’s military presence in Cambodia (and Laos), the political and economic dependence of the Soviet Union, human rights, boat people etc., etc., etc. “You are telling me that we have isolated ourselves from the West by joining COMECON. Viet Nam pursues an open policy towards all sides. We are members of COMECON as well as the World Bank. How is it in the case of Denmark – you stick to the World Bank and the Americans, right? I think you are more one sided than we are,” Thach offered. He wrapped up the interview by offering me a plane ride to Phnom Penh to see for myself that Cambodia had not been turned into a Vietnamese prison camp. 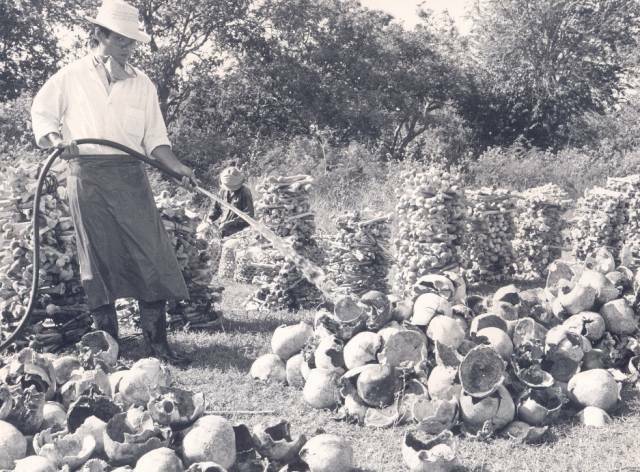 Ole Johnny Sørensen’s pictures from the Killing Fields went around the world – some media considered this ‘communist propaganda’ passed on by naive Danish newsmen. When it was no longer politically convenient to downplay the atrocities of Pol Pot’s Khmer Rouge, the Western world did acknowledge that the Vietnamese had eliminated a genocidal regime i Cambodia. We did take Thach’s advice and later visited Cambodia. By coincidence we met a truly gruesome sight a few kilometers from Phnom Penh. From a distance it looked like some farmers were watering gleamingly white cauliflower. As we got closer, we realized that they were cleaning skulls – thousands of skulls. Bones were neatly stacked all over the area. Vietnamese army medics and Cambodian workers were cleaning up yet another shallow mass grave. 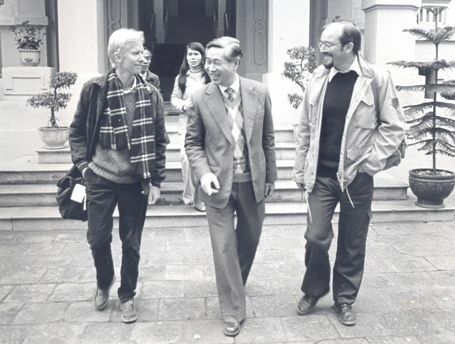 Some Western editors wrote off the whole thing as communist propaganda, when we returned with the documentation – just a couple of naive Danish reporters stuped by the Vietnamese propaganda machine. The same editors had responded similarly to our Agent Orange material. Then – and now – let Ole Johnny’s pictures speak for themselves. Over the coming years I had the privilege of another three sessions with the Silver Fox. I never managed to corner him. Not even when his government signed a deal with the Shell corporation on oil-exploration in the Vietnamese off shore oilfields – at a time when many countries shunned Shell because of their activities in Apartheid South Africa. “It is easy to be choosy for rich countries like your own, we have 65 million people to feed,” Thach shot back with fiery eyes. The conversations always ended with his roaring laughter. Then all of sudden Thach retired into oblivion, officially because of ill health. According to the rumors he was asked to step aside to make room for a more flexible and pragmatic generation of shrewd Vietnamese politicians, who took charge in taking Vietnam onto the road of reform – ‘doi moi’. Other rumors had it that Thach had been removed to pave the way for improved relations with Beijiing – Thach had been a very harsh and very public critic of China, possibly since 1972 when chairman Mao cut a deal with president Nixon – at the expense of Vietnam. Thach is having fun at the expense of two Danish reporters. Surprisingly enough the old fox resurfaced in February 2007, when his widow on his behalf received The Gold Star one of the highest honors of the state for ‘comrade Thach’s lifelong contributions to the revolutionary cause’. As my own tribute to him, I now have a photo in my office of dong chi Thach on the stairs of the Bo Ngoai Giao – the Ministry of Foreign Affairs, probably the most beautiful of all the beautiful colonial buildings still to be seen in Ha Noi. Thach stands there grinning with me and a fellow Danish hard hitting reporter, Jørn Ruby. That morning Jørn and I have joined forces to catch the old fox. He escaped without too much effort. In those days most of Ha Noi’s most famous veterans were still alive. Some of us worked very hard to get access to Le Duc Tho – Ha Noi’s legendary chief negotiator in the Paris marathon peace negotiations. Le Duc Tho was Henry Kissinger’s living nightmare and hero to his own people. Tho added to his standing by refusing to receive the Nobel peace prize, shared by Kissinger. Rumours had it, that Tho did not want to be seen in such bad company. After going into retirement he did not want to be seen at all. Numerous requests for interviews were refused politely. As frustrating as it was, the government press office offered very interesting alternatives. One of them was none other than Le Duc Tho’s younger brother, Mai Chi Tho – a legend in his own right. and the Sai Gon regime spent enormous ressources in vain to locate his headquarters in the jungle. Like his brother, Mai Chi Tho joined Viet Minh’s strugggle against the French, when he was still a teenager. According to one legend, Mai Chi Tho earned his first revolutionary credentials as an office boy in the French military headquarters, when he poisoned the coffee that killed an important French military intelligence officer. When we asked him to confirm the story, Mai Chi Tho like other senior leaders refrained from speaking about his personal role during fifty years of revoloutionary struggle. Mai Chi Tho spent most of the American war in the South – as a political commissar with the guerillas in the ‘Iron Triangle’ – the devastated war zone in Tay Ninh province, some sixty miles from Saigon. American and South Vietnamese intelligence were convinced that the military and political headquarters of Ha Noi’s Southern front Central Office for South Viet Nam (COSVN) were located in Tay Ninh. Thousands of square miles of forest was destroyed with chemicals and napalm, but COSVN was never found. “The Americans were wasting their time, because COSVN only existed in their minds. We never stayed for very long in the same place, because it was too dangerous,” Mai Chi Tho said with a laugh. After the war he went on to become the People’s Committee Chairman in Ho Chi Minh City – one of the most prestigious positions in postwar Vietnam. Mai Chi Tho was just as cunning as Thach in Ha Noi – but with a brusque and impatient manner. He had no time for questions based on ‘western bias’. He soon lost patience too with the time consuming translation from Vietnamese to English and vice-versa, and to our surprise he continued in fluent German. It proved that part of his revolutionary education had been spent at a Karl Marx Institute somewhere in East Germany, officially known as the the German Democratic Republic. When we referred to Western reports about the continued ‘reeducation’ of high ranking member of the former regime, Tho furiously shot back. Tho barked an order to an aide. The same afternoon a meeting was set up with a former South Vietnamese general, who according to press rumors had died in prison. We had a few, but the old warrior was obviously uninterested in wasting too much time in educating foreign reporters. When we asked him to comment on Western reports that he had had a fall-out with general Tran Van Tra – the legendary Southern communist general and military genius, our biased-questions-qouta was obviously full. Mai Chi Tho rose and wished us success and good health. “I think you will understand Vietnam very well,” Tho said. At that time I did not know that this is a Vietnamese way of telling you that you have not understood anything at all so far. Later we came to realize that Tho apparently did decide to give us an educational experience. On his order a fascinating series of interviews was arranged with surviving guerillas from all the most famous confrontations in and around Saigon. Tho even put an old black and bullet proof Mercedes at our disposal. The car used to belong to South Vietnam’s president Nguyen Van Thieu, and I sometimes wandered what conversations had went on in the back seat, as the aging engine coughed itself through the hundreds of miles on the damaged roads of Southern Viet Nam. Tho himself soon went back to the North to become Minister for Security – I am sure he was the right man for the job, but alas for the poor souls that may have antagonized him.